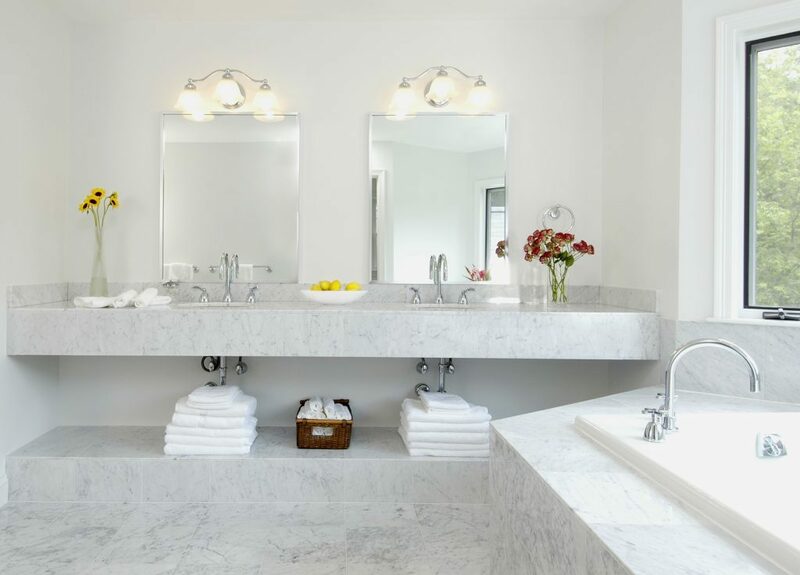 Thinking of Bathroom Remodeling this Spring — Here Are Some Perfect Inspirations - FBN Construction Co., LLC. Spring weather got you feeling antsy for a remodelling project? Bathroom remodelling might be the perfect point to start from. After all even minor bathroom renovations typically have one of the highest return on investment (ROI) , they will pay you back for a long time and can completely change the feel of your home. 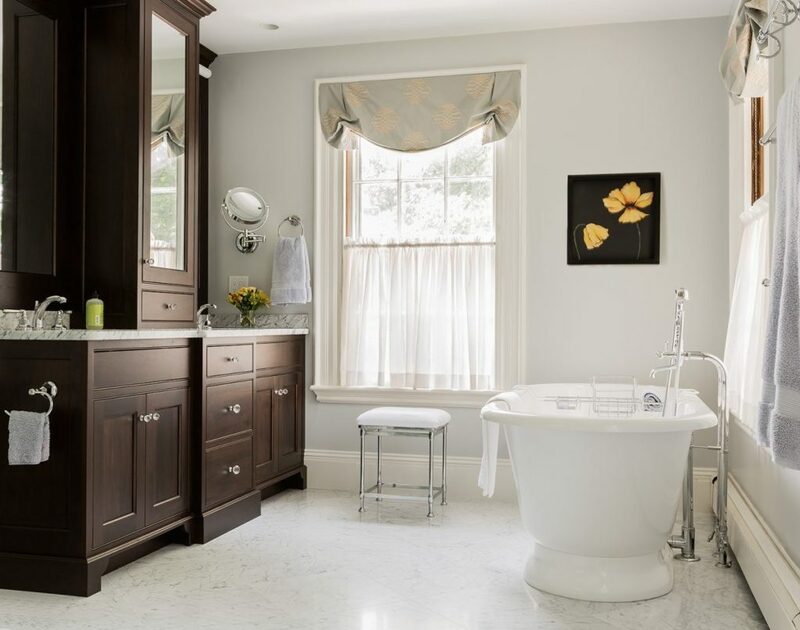 Check out these 7 FBN bathroom remodels for some renovation inspiration of your own. This complete bathroom turnaround decluttered and updated the second floor of this home in Weston. The light walls are complemented by the abundance of natural light flooding in through the single-pane windows, and the dual sinks allow for harmonious usage of the space. Elegance with deep simplicity. Perfect right? This designer bathtub creates a light and ultra modern feel without taking up too much room, adding that wow factor to your favorite space. 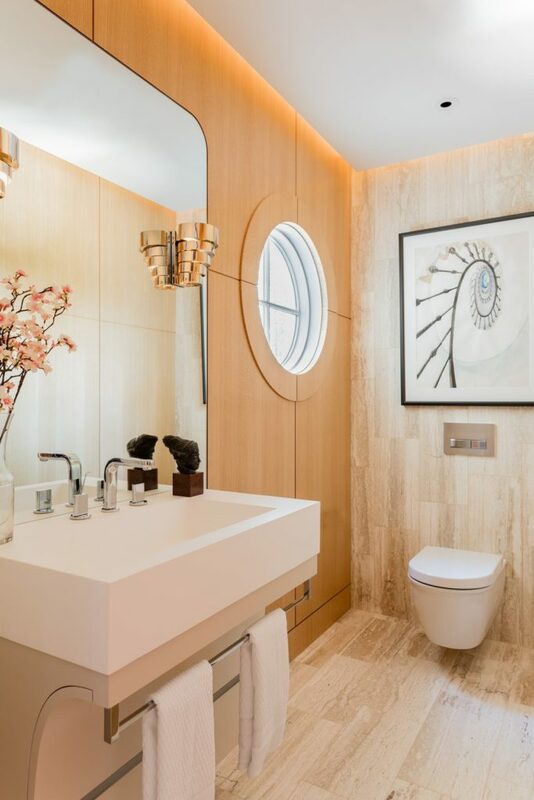 And check out the glass pane separating the your dry and wet areas, perfectly designed to the right size, further adding to the openness of this light filled bathroom. We love this floating-feel-minimalistic bathroom. Elegant and yet functional with space for hanging a towels underneath creating ease of accessibility while simultaneously saving space. Not to mention power of gentle addition of right accessories, notice the light fixture, picture frame with the spiral staircase and porthole window and how they are all bound together in one consistent feel? Would love to go to a spa everyday? This is your bathroom. From a built-in bench to dual shower heads to waterfall faucets spraying from three directions, this bathroom’s many amenities will never cease to amaze, completed with the ultra calming perfect shade of aqua marine blue. 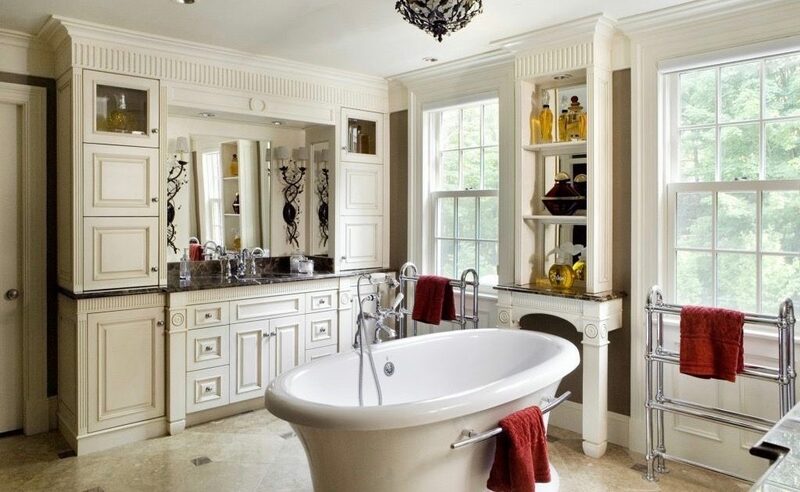 This colonial-style bathroom is the peak of luxury. Imagine drawing up a bath in the exquisite centerpiece tub, and take a look at all that cabinet space to tuck away your toiletries. A bathroom out of Downton Abbey, with all contemporary amenities. Perfect for those with duke or duchess kind of an elegant taste. Bathrooms don’t have to be all neutral to be elegant. A splash of color can always give it an extra personal touch. 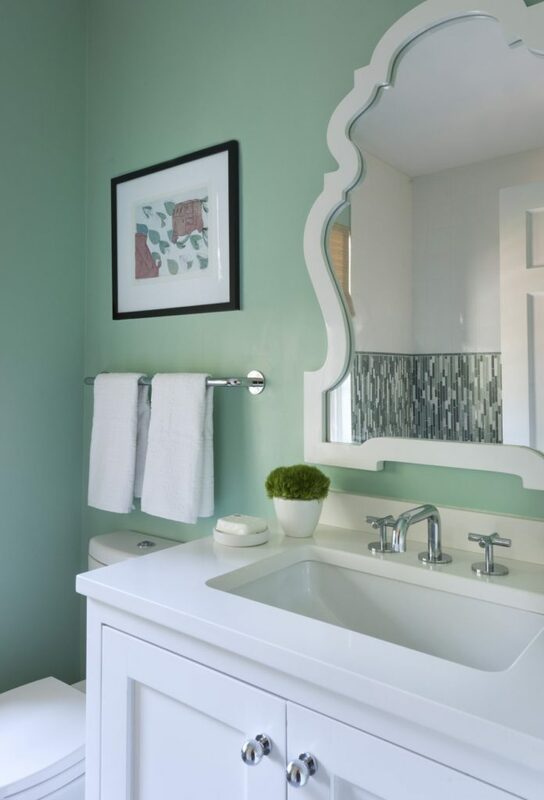 This seafoam green paint is contrasted by crisp white accents and ties together with the refreshing vertical glass tile backsplash on the opposing wall. One of our all time favorites. Freestanding tubs are all the rage and will take your bathing to the next level. Plus, these dark mahogany cabinets add a rich feel to the clean space. Another one with be-your-own-royalty theme. The timeless elegance fit for a luxurious side of you.